The name ‘Northrepps’ is derived from the Old English word ‘repel’, meaning strips of land in a fen that can be tilled. The parish is located in the North Norfolk local government district, and was reduced in size in 1906, loosing land to the parish of Overstrand to the north. Northrepps is just 500 metres from the coast at its nearest point, bordered to the north by Cottage Wood, largely given over to the Forest Park Caravan Site. Woods known as Fox Hills also remain in the eastern corner of the parish, which is cut to the west by the railway line from Cromer. Largely low hills and valleys, the soil is light and the subsoil gravel. The parish contains the village of Northrepps, as well as the Frogshall and Crossdale Street areas. Evidence for activity during the prehistoric period is particularly scarce. An interesting piece of worked jet or shale (NHER 19662) may be from the prehistoric period, but the only site with any density of finds is just east of Frogshall, where worked flint flakes, blades, scrapers and an arrowhead have been recovered (NHER 40243). Less than a handful of other flint objects have been found (NHER 6751, NHER 6752, NHER 25414, NHER 33237). Evidence for the Bronze Age is also limited, with only two monuments attributed to this period. The first is a ring ditch occupying a prominent topographical location at the eastern end of the Cromer Ridge just north of Northrepps village, overlooking the head of the valley to the west (NHER 11708). The second is a similar structure (NHER 38676), located at the head of another valley right on the westerly border of Northrepps and close to similar structures on Roughton Heath. Although it is likely that these sites are Bronze Age, neither can be dated with complete confidence. The only objects dated to this period are the fragments of an axe, rapier and chisel recovered in the north of the parish (NHER 35451) and a hoard of five socketed axeheads recovered in the most southwesterly corner of the parish (NHER 11969). As with objects from the earlier prehistoric periods, Bronze Age pieces have not been recovered in the numbers found in more central parishes. 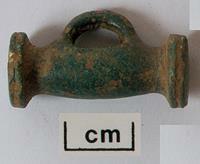 The low numbers of finds recovered from the prehistoric periods continues into the Iron Age. Finds are limited to pottery sherds (NHER 6753) which were recovered very close to one of the possible Bronze Age ditches (NHER 11708), and an extremely important Iron Age toggle (NHER 33237) from an area just south of Northrepps village. However, the dating of two monument groups to this period is unusual. A linear enclosure near the eastern border of the parish (NHER 38854) has been identified, along with another 150m to the west (NHER 38855), and one on the very edge of the easterly border (NHER 38895). These sites are particularly interesting as they appear to be related to a Roman farmstead and field system just 1.75 kilometres to the west (NHER 13063 and NHER 38808). The second group on Toll’s Hill, 2.5 kilometres away to the northwest, shows a series of ditches and trackways that have also been identified as Late Iron Age to Roman (NHER 38811, NHER 39107). This suggestion of continuous occupation through the Late Iron Age and into the Roman periods is particularly interesting. Roman occupation evidence for this parish seems to continue this agricultural theme, presenting possible round houses (NHER 38806, NHER 38804) or farmsteads (NHER 13063). 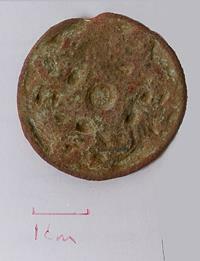 Roman artefacts from this parish are also far more limited than more central parishes, with small numbers of low denomination coins being the most prominent find (NHER 35444). Only a handful of personal items, such as brooches (NHER 33236) or mounts (NHER 33810) have been recovered in any area apart from the Fox Hills wood, where a small cluster of finds, including pottery sherds and a key have been recovered (NHER 40243). There is also little evidence for activity during the Saxon period; only one site, just east of St Mary’s Church, shows definite Late Saxon occupation (NHER 32889). Late Saxon pottery sherds were also recovered from this site, as well as from the south of Fox Hills (NHER 40243) and from a field just north of Crossdale Street. An early Saxon small-long brooch (NHER 40663) has been retrieved from the fields surrounding St Mary’s church, but as with previous periods the finds from the Saxon period are basic items and not those belonging to rich or powerful people. Evidence so far has suggested that the occupants of Northrepps were agriculturally based, and this is confirmed by entries in the Domesday Book, which despite suggesting that the value of the parish was reasonably low, does state that it held two mills and a church. These mills confirm the central role of farming in the community. It is also interesting that despite the apparent lack of material wealth (only one Saxon period coin has been recovered in this parish, NHER 33238), Northrepps built a church where other richer parishes such as Oxborough remained without one until the medieval period. Exactly what church the Domesday Book refers to is unclear. The current parish church is St Mary’s, a predominantly late medieval church, which underwent significant restoration in the 19th century (NHER 6769). Inside, a splendid stained glass window in the south aisle depicts a host of angels and dates from the 20th century, and the remains of a 15th century roodscreen can be seen. No other ecclesiastical sites have been reported in Northrepps, and the only other medieval sites are Toll’s Hill, which may have been the site of a beacon during this period (NHER 13147), and some ditches near the Rectory at Frogshall which may be the remains of a medieval moat (NHER 38799). Cropmarks on aerial photographs also suggest medieval field systems in a large swathe of fields to the west of the village (NHER 38807), as well a possible mill on the border with Southrepps (NHER 38955), but neither of these features is definitely medieval. A reasonable number of medieval objects has been recovered from this parish, largely by metal detector, most frequently coins (NHER 40663) and buckles (NHER 35450). However small clusters of objects have been identified, one of the densest being (NHER 39525) just west of Northrepps, on the site of a possible medieval field system (NHER 38807). Here a large variety of objects including buckles, coin weights, furniture and book fittings, pendants and a stylus have all been recovered. Objects also of interest are the rim of a late medieval copper alloy vessel (NHER 36255), and an exceptional medieval gilded cast copper alloy openwork buckle plate (NHER 33242). In 1883 ownership of the parish was split between J. H. Gurney, who was the principle owner, Lord Suffield, who was lord of the manor, and S. Hoare. The manor of Northrepps therefore seems to have been governed by the Suffield family from 18th century Gunton Hall (NHER 6815) in the parish of Hanworth, five kilometres to the south of Northrepps village. The previously mentioned S. Hoare went on to become Lord Templewood, responsible for the construction of Templewood House in 1938 (NHER 6804), and a minister in Churchill’s coalition government. Templewood is now a listed building, and after the death of both Lord Templewood and his widow passed first to Paul Paget, one of the original architects, and now to his widow, Verity. J. H. Gurney, described as the principle land owner, was at that time resident at Northrepps Hall (NHER 13146), not actually a hall or manor house but a converted farmhouse with a largely 19th century exterior. The Hall is now a listed building, along with a large number of other buildings including Church Farm (NHER 13278), originally from the 17th century, Winspurs Farm Barns from before 1780 (NHER 25394), and the Old Manor House (NHER 34076), a Tudor building at the centre of the village that seems to have been two smaller houses in the past. Evidence of post medieval activity such as coins (NHER 36255), tokens (NHER 39525), strap fittings (NHER 40663), and pottery (NHER 40243) are reasonably common but not notably abundant. Further listed buildings from the post medieval period can be found spotted across the parish, totalling some thirteen, a large number for a parish of this size. There are also twelve sites related to World War Two, including bomb craters (NHER 38927, NHER 38926), anti-aircraft batteries (NHER 38918), searchlights (NHER 38795), training areas (NHER 38927) and of course pillboxes (NHER 38923). Local rumour also has it that there were a large number of forced landings in Northrepps by the USAAF in World War Two, though none have yet been identified. Ruth Fillery-Travis (NLA), 6 December 2006. Kelly's Directory for Cambridgeshire, Norfolk & Suffolk, 1883. William White's History, Gazetteer, and Directory of Norfolk, 1883.